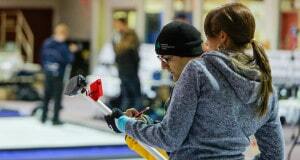 Scotland’s Tom Brewster covered the pinhole with a last-rock draw and Sweden’s two-time Olympic gold medallist Anette Norberg and her team got untracked to win 20-point skins games at the World Financial Group Continental Cup on Saturday morning, extending the lead for Team World over Team North American to 32 points. 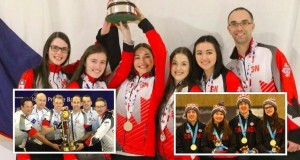 Canada’s Glenn Howard, directing Sherry Anderson, Brent Laing and Sherri Singler, succeeded in keep the Americans within shouting distance, hanging an 18-2 mixed skins beating on Sweden’s Niklas Edin and his team of Eve Muirhead, Christoffer Svae and Qingshuang Yue. “The skins seemed to work for us,” said Howard, a veteran of the format. “I have to commend the two Sherry(i)s, they played great. That was a well-curled skins game — pretty darn close to as good as it gets. I thought we had Niklas in trouble every end and, ironically enough, if he sticks his last angle raise we go to a draw-to-the-button. But that’s skins for you. Edin only managed one skin in the match but could have turned it around with a 10-point skin on the final end. Brewster led his match with Pete Fenson of the U.S. 10-4 playing the last end but the Yanks forced a carryover to a button-draw on Fenson’s last shot. The Bemidji skip then drew the button with his shot but Brewster followed with a button draw that covered the centre measuring-stick pinhole. Norberg and her team erased the sour taste of two team losses on Thursday and Friday by taking five skins and a 16-4 decision against Patti Lank of the U.S. Lank, too, had a long chance to square the account with a difficult last shot in the eighth end but it didn’t come off. “I like playing the skins,” said Norberg, “and I think we played a little better today. Singles play, the six-shot Hot Shots points game, takes over the spotlight for an afternoon draw at 1:30 p.m. PT with 30-point skins returning at 6:30 p.m. In the 30s, Eve Muirhead of Scotland tackles Amber Holland of Canada in women’s skins, Howard takes on Edin in men’s skins and teams skipped by Thomas Ulsrud (Norway) and Jeff Stoughton (Canada) go at it in mixed skins. 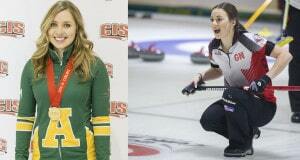 The Cup debate concludes Sunday with women’s 55-point skins (Stefanie Lawton of Canada vs. Bingyu Wang of China) at 10:30 a.m. and 55-point men’s skins (Jeff Stoughton of Canada vs. Thomas Ulsrud of Norway) at 5 p.m.